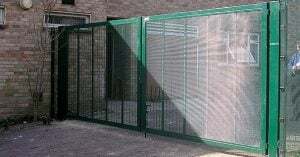 Security gates are designed for safety and protection. Attractive in appearance, these gates can be automated or manually operated. Our security gates can supplied in various heights and sizes to suit the required space. Security gates are recommended for use on a wide range of domestic, commercial and industrial sites. These gates can be made to British Standard requirements and come complete with posts, hinges, dropbolts and padlockable slidelatch. All gates are hot dipped galvanised to BS EN ISO 1461 and can be Polyester Powder Coated to BS EN 13438. All our security gates have optional extras that can be added for extra peace of mind.